We’ve found Gary LeVox age 19. Actually Hunter Hayes is very much his own artist. The new country artist has his first song ready for release at country radio and the video just became popular at CMT and CMT.com over the weekend. After listening through the video a few times there is no doubt Rascal Flatts and lead singer Gary LeVox had an influence on Hunter. His vocals seem inspired by the unique pop-country singer. Yet while Hunter sounds inspired by Gary there is no doubt Hunter is his own artist. Storm Warning is a catchy country song. It seems like what I guess could be called a throwback to the early days of Rascal Flatts back in the early ’00s. During that time there was a switch in country music where the sound leaned on pop-heavy influences. It seems country is heading back in that direction again. Artists like Hunter Hayes seem to be the ones ready to take the wave of fans in that direction. 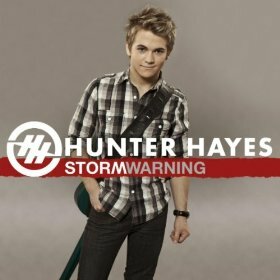 Storm Warning is a simple love song about a guy falling for a girl without warning. He looks back now after just a bit of time and realizes how fast he fell for this girl. She came out of nowhere and took him by surprise. If only he would have had a warning she was coming his way. In the video we get a look at how talented Hunter is. He’s playing just about every instrument in the studio on the video. It’s impressive to see him passionately singing and playing. I’m sure having his first single and video out is pretty exciting. This kid seems driven to make a big impact in country music in 2011. A little interesting tidbit about the Hunter Hayes – Rascal Flatts connection is Hunter had a co-write on the track Play on their latest album. I’ve been hearing that track on AOL’s New Country First and it’s a good song. What do you think of Hunter’s new song? Will he be a big hit in 2011?